Predictive maintenance (PdM) uses non-intrusive testing techniques to assess a machine asset's condition. PdM can be "route-based" with scheduled measurement by operations staff OR accomplished via installed sensors, which is also known as Condition Monitoring. Installed sensors allow for remote 24/7/365 vibration monitoring - the ultimate in safe, consistent and reliable monitoring of key machinery. The following guide provides a brief overview of the dominant approaches to maintenance and repair as well as details what sets them apart. The purpose of this article is to illustrate that each maintenance strategy contains both advantages and drawbacks, and, that for many manufacturers, no single strategy within a plant will be wholly successful. The task of selecting and implementing a distinct maintenance plan for each part of your workspace – and possibly, in some situations, each individual machine – can seem at first glance incredibly daunting. It is for this reason that the strategy overview and comparison below is provided. The most important part of establishing a thorough, successful, efficient maintenance plan is understanding that there are certain situations for which each approach is the most beneficial. For more information about any of the maintenance strategies discussed below, please see the in-depth articles listed at the end of each section. If you have any further questions, feel free to contact ProAxion© at any time. The dominant maintenance strategy for many decades before the emergence of alternatives listed below was reactive maintenance. Also known as breakdown maintenance or run-to-fail maintenance, reactive maintenance is basically wait and see. Equipment is not repaired until after it has failed, broken down, or otherwise ceased to perform one or all of its intended functions. The later-emerging maintenance approaches primarily advertised themselves as complete and total replacements for reactive maintenance, referring to it as old fashioned, inefficient and completely unnecessary. However, like all maintenance strategies, reactive maintenance does have its advantages. It is fairly cost-efficient, as it ensures that unnecessary maintenance on machines not even close to failing will never be performed. For this reason it can also be labor efficient, as employees are not required to take on tasks such as monitoring the equipment for signs of failure, which can often necessitate extensive additional training. Reactive maintenance’s primary drawback; however, is the significant unplanned downtime required to repair a machine which has already broken down, as the nature of the problem and source of the failure must be identified before maintenance occurs. As the costs of downtime, losses in production and customer satisfaction, begin to outweigh the benefits of reactive maintenance, alternatives should considered. However, reactive maintenance is recommended for nonessential, duplicate or extremely infrequently used machinery. Nonessential equipment includes things such as light bulbs and fans, while duplicate equipment refers explicitly to situations in which two or more machines exist in one workspace which serve the exact same purpose and other duplicates can carry the manufacturing load while one machine is repaired. Learn more about reactive maintenance. Initially introduced as an answer to the unplanned downtime resulting from reactive maintenance, preventive maintenance performs upkeep tasks before any failure or breakdown occurs. A schedule is established and maintenance activities such as cleaning, refilling lubricating oils or other liquid components, and replacing parts occur strictly in accordance with that schedule. The schedule can be either time-based, with maintenance occurring every few weeks or months, or event-based, in which maintenance occurs when following a specific event such as a machine having been used 100 times or a conveyer belt having fallen below a certain speed. Average lifespan statistics of the various machines are often used when establishing a time-based schedule. Changing the oil in your car every 5000 miles is an example of preventative maintenance. Preventive maintenance offers the advantage of potentially completely eliminating unplanned downtime, as maintenance of machines is carefully scheduled and can be worked around production. Regularly performing scheduled maintenance tasks can also decrease health and safety risks associated with more dangerous machinery. However, preventive maintenance can be extremely expensive, as it is performed far more frequently than any of the other types of maintenance listed here. It is likely that most machines relying on a preventive maintenance strategy are being cleaned and repaired more often than is actually necessary to prevent breakdown. In addition, because maintenance tasks are carried out so frequently, employees must be trained in how to perform them, which can be both a costly and time-consuming and because humans are involved and transitions between human are not perfect, occasionally lead to down-time. Preventative maintenance strategy is recommended for machines which experience a regular, linear increase in failure chances as they age. In those cases, regular cleaning and upkeep can sometimes be found to increase the lifespan of the equipment. It can also be useful as a precaution for machines which present a large health or safety risks to their operators should unplanned, unexpected breakdown suddenly occur. However, in situations other than these, preventive maintenance is usually not the most efficient or cost-effective strategy to employ. Predictive maintenance is the most universally applicable of the strategies discussed in this article. Its core principle is that the majority of equipment failures are not random, and, in fact, occur for a number of common, observable reasons such as over-stressed components, lack of sufficient upkeep and cleaning, improper design or assembly, or gradual damage from the surrounding environment. Barring extremely rare “truly random” failures, such as those caused by an earthquake, severe storm or other natural disaster, all breakdowns can be successfully predicted and maintenance can be performed well in advance of their occurrence. Predictive maintenance relies on a technique known as condition monitoring, real-time observation of a given machine’s performance. Different types of condition monitoring focus on a number of performance indicators including but not limited to temperature, sound, physical vibrations, and the quality of or presence of debris in lubricating oil. Condition monitoring can be accomplished by manual measurement of the machine while running or by installing sensors on machines from which data can be collected either locally or remotely. With the advent of wifi and cellular communication as well as innovation in sensors, many types of hardware exist to make condition monitoring easier than ever before. These include the Tactix® device produced by ProAxion©, which is capable of continuously measuring vibration and temperature. Predictive maintenance and condition monitoring are able to minimize or eliminate downtime in a manner unequaled by any other strategy. Systems such as Tactix® are able to perform their monitoring duties continuously while the machines are running, eliminating risks to employees or contractors making manual measurement of the machines while running. Tactix® -like systems are also extremely affordable; predictive maintenance saves money in the long term when compared with the too-frequent preventive maintenance. While some employee training may be required, specifically regarding the data provided by the condition monitoring equipment, nowadays, most devices (including Tactix®) come with a software element which organizes the data into an easily readable, simple to interpret form and provides instant alerts through phone, text or email should monitored equipment need service. In addition, predictive maintenance provides all of the advantages of preventive maintenance as discussed above. The average lifespans of the monitored machines are increased, while safety and health risks are decreased. Lastly, because predictive maintenance focuses on determining the root cause (the what, the where, the why, and the how) of each potential machine failure, the data provided by the condition monitoring equipment can be used to improve or eliminate issues in later versions of and upgrades to the machinery. Predictive maintenance can be successfully applied to almost any piece of equipment or machinery. It is only not recommended for highly nonessential equipment, such as lightbulbs and fans as described above, or possibly machinery which is already extremely old and needs maintenance of a highly exceptional frequency. However, in most situations, predictive maintenance is the most efficient and advantageous choice. To learn more about predictive maintenance, see here. For a more detailed look into the available types of condition monitoring, see here. Reliability-centered maintenance (RCM) is a comprehensive approach to maintenance which incorporates elements of all three of the strategies described above. It is usually performed by a skilled individual, often a contractor or other outside figure, or a group of trained employees selected from within the company or organization. It is a multi-step, somewhat time-intensive process with two goals: identifying the most prevalent modes of failure and determining the most effective method of preventing each identified mode. The RCM process begins with a thorough, complete analysis of the plant, typically including all equipment but beginning with those most essential to overall productivity. Failure modes – the whats, wheres, whys, and hows as discussed above – are identified and ranked in terms of how likely they are to occur and how detrimental to productivity their occurrence would be. A method of avoiding each failure mode is determined; common examples include “regular cleaning” “replacing a part each year,” “monitoring temperature to avoid it becoming too high,” or “more frequent changing of lubricating oil”. Once a machine’s failure modes have been identified, the best maintenance strategy is selected. While predictive maintenance is ideal for most pieces of equipment, in some specialized cases preventive maintenance or reactive maintenance are instead recommended. 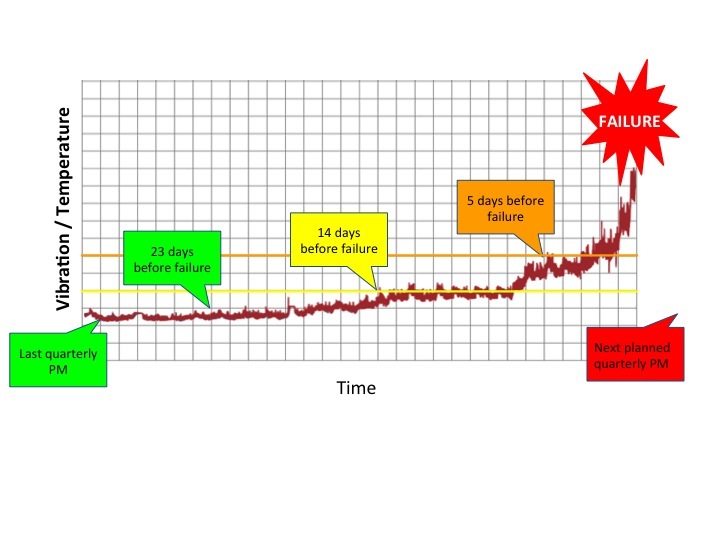 Also, in cases where predictive maintenance is the suggested approach, RCM analysis can also recommend the best type of condition monitoring to combat the equipment’s identified failure modes. Vibration monitoring, such as that performed by Proaxion’s Tactix® device, is an extremely common choice, as are temperature and sound monitoring and, in cases where it is applicable, the analysis of lubricating oils. RCM typically involves a significant upfront investment of time and money in order to achieve the most thorough analysis possible. However, it is an efficient approach in the long term, as the life spans of each machine are typically extended due to the chosen maintenance strategy, maintaining asset value and unplanned downtime with associated lost production and customer goodwill is continuously reduced. Learn more about reliability-centered maintenance. Like RCM, total productive maintenance (TPM) is an approach which focuses on improving maintenance efficiency throughout an entire workshop. It is based on the achievement of three goals: the simultaneous improvements of equipment availability, equipment performance, and product quality. Together, the improvement of these factors create a higher overall equipment efficiency (OEE), meaning that each machine is functioning at peak speed, with peak efficiency and little to no downtime and is not producing defective or unusable products. As with reliability-centered maintenance, total productive maintenance selects a maintenance strategy for each piece of equipment in the workshop. Typically, predictive maintenance is the most widely chosen approach, with both preventative and reactive maintenance also playing a role. Root cause analysis, the identification of failure modes for individual machines, is utilized in both RCM and TPM. However, TPM is unique in that small, regular preventive tasks such as cleaning and changing oils are carried out for each piece of equipment, in accordance with a strict schedule, and are typically assigned to regular employees rather than specialists or outside authorities. TPM implements a series of principles and goals known as the five Ss and eight pillars, which are discussed in greater detail in our article focusing on the process. Seemingly small tasks, which might otherwise be overlooked, are emphasized as key parts of the overall improvement process. Examples include making sure that each employee’s workspace and the areas around machines and equipment are kept decluttered and that small, portable tools and pieces of equipment have clearly labeled storage locations. The central tenet of TPM is that, with small improvements such as this carried out consistently, larger overall improvements in safety, productivity and efficiency will occur. It is important to note that TPM will only be truly effective if all employees at all levels are fully engaged in and committed to the process of achieving improvements. Goals should be decided collaboratively by employees at the beginning of TPM implementation. Engagement at the administrative level is encouraged – even employees who do not work directly with the machines or equipment can apply the ideals of TPM to their workplace, such as decluttering and careful scheduling. Another duty of the administrators is to acknowledge and celebrate achievements and improvements created by TPM, which has been proven to greatly increase employee morale in both the short and long terms. A successful TPM implementation will leave every employee feeling that they are a key part of the process and have a role to play within it. Learn more about TPM, including a detailed explanation of the 5 Ss and eight pillars. The maintenance strategies discussed above are the most prominent; however, that does not mean that they are the only types in existence. Many companies and organizations develop their own maintenance goals focused on, for example, minimizing health and safety risks (giving high-risk machines first priority for maintenance tasks) or maximizing profits (carrying out careful loss-profit analyses on each machine, and replacing equipment as soon as it shows risk of operating at a loss). It is important to determine what your company or organization needs out of a maintenance plan before choosing one. In addition, choosing a maintenance plan is not the only step in developing an efficient, productive workplace. Make good design, equipment and material choices when designing or purchasing new equipment. Constantly pursue information about the machines which you have chosen – seek out publicly available data about lifespan statistics and commonly identified failures and their causes. Share your own collected maintenance data so that manufacturers of machines will be able to address and rectify common failures when the machine is updated or a new version is produced. Keep yourself aware of new technologies, and implement fixes for recurring problems if they become available. The process of choosing a maintenance strategy or approach for your workplace may not be simple. Proaxion believes in keeping our customers informed and educated about the pros and cons of the various types of maintenance. If you have any questions about the strategies discussed in their article, their application to your workplace or are interested in evaluating our revolutionary Tactix® condition monitoring devices, please contact us.